So far Leanne Cadman has created 7 blog entries. Many thanks to the Candelas and Leyden Rock neighborhoods! Both communities are helping us kick off our annual spring food drive with a little friendly competition. Over the next several weeks we’ll see which neighborhood collects and donates the most food to Community Table. The winner will receive a beautiful trophy and most importantly, bragging rights. Our spring food drive is one of the most important we do during the year. Typically food donations drop off after the holidays. You can help re-stock our warehouse and make sure we have enough food for the busy summer months when the needs of struggling families are even greater because kids are not receiving free breakfast and lunch at school. It’s easy to help. Watch your mailbox for information about the annual Stamp Out Hunger food drive and your blue donation bag. On Saturday, May 11 place your food donations in the blue bag and put it by your mailbox by 9 a.m. Our volunteers or your letter carrier will pick up your donation. Our goal is to collect 100,000 pounds of food this spring. There are thousands of struggling families who are counting on you. Beginning Thursday, April 11, our food pantry will be open for shopping from 10:00 a.m. to 3:45 p.m. All other hours remain the same. 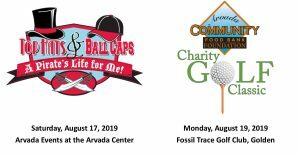 Food Donation Hours: Monday-Friday: 9:00 a.m. to 4:00 p.m.
Mark your calendar to attend the ACFB Foundation’s annual gala and charity golf classic benefitting Community Table. These very special (and fun) events raise money to feed the hungry and provide emergency assistance and self-sufficiency programs for struggling families in our community. This year’s pirate-themed Top Hats & Ball Caps gala at the Arvada Center from 6 to 10 p.m. features a sumptuous plated dining experience, signature cocktail, silent auction, jewel in a glass, music, dancing, a treasure hunt and more. The 18-hole scramble at Fossil Trace Golf Club features two shotgun starts, 8 a.m. with breakfast and lunch or 2 p.m. with lunch and a cocktail party, prizes for a hole-in-one and men’s and women’s foursomes, mulligan packages, complimentary beer and water and gift bags. You can help make these events a success by purchasing gala tickets, becoming a sponsor or donating silent auction items. Gala tickets are $75 per person. With your support, we can feed the hungry and help put those in need on the path to self-sufficiency. 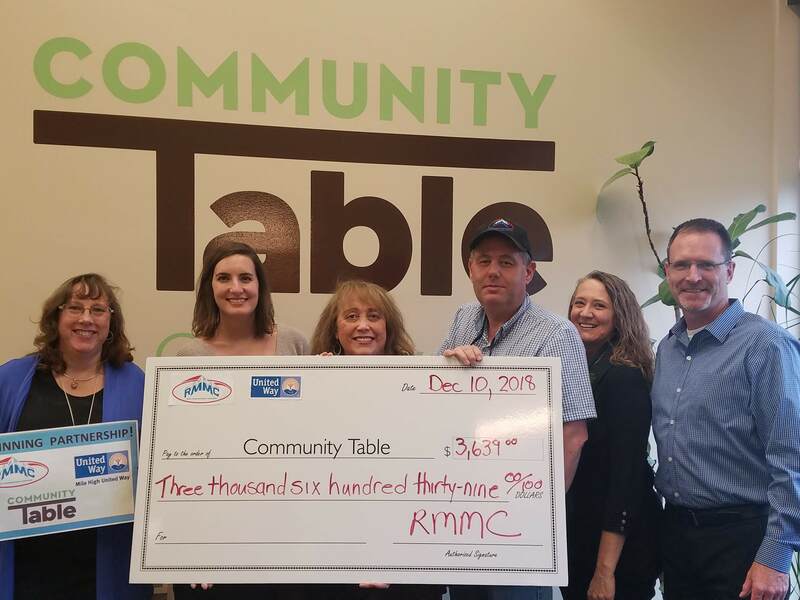 A big THANK YOU to all the employees at Rocky Mountain Metal Container for their aluminum can recycling program and their annual Mile High United Way giving campaign that raised $3,639 for Community Table! The employees also collected personal care products, which we always need and thousands of shopping bags for our Client Choice Pantry. We so appreciate your continued support! 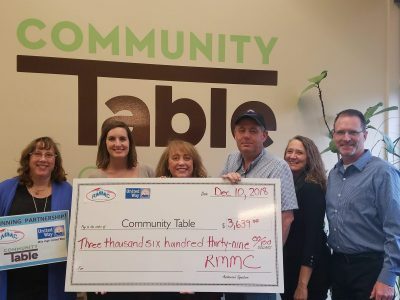 You can help feed your hungry neighbors and give them the resources they need to become self-sufficient by supporting Community Table on Colorado Gives Day, Tuesday, December 4. Across Colorado, 1 in 10 people go hungry every day, and half of these are children. Your support can put an end to families having to decide between buying food and paying other expenses. To donate to Community Table NOW through midnight on Colorado Gives Day, click on the DONATE NOW button and use the “CO Gives Day” option under donation frequency to schedule your donation to process on Dec 4. Your donation is in good hands at Community Table. We have a “4-Star” rating on Charity Navigator, a “Gold Seal of Transparency” on GuideStar and we are a Better Business Bureau Accredited Charity, which means you can trust that your donation will be used to help those in need in your community. Colorado Gives Day, which began in 2010, to increase online giving has raised more than $182 million for Colorado nonprofits. This year, Colorado Gives Day features a $1 million incentive fund, created by Community First Foundation and FirstBank. For every donation Community Table receives on Colorado Gives Day, we will receive a portion of the incentive fund. Schedule Your Colorado Gives Day Donation Today! Across Colorado, 1 in 10 people go hungry every day, and half of these are children. Your donation can put an end to families having to decide between buying food and paying other expenses. Your donation is in good hands at Community Table. We have a “4-Star” rating on Charity Navigator, a “Gold Seal of Transparency” on GuideStar and we are a Better Business Bureau “Accredited Charity”, which means you can trust that your donation will be used to help those in need in your community. Don’t want to wait until December 4 to make your donation to Community Table? You can schedule your Colorado Gives Day donation today through midnight on December 4 by clicking the DONATE NOW button below and using the “CO Gives Day” option under donation frequency to schedule your donation to be counted and processed on Colorado Gives Day. Colorado Gives Day, which began in 2010 to increase online giving, has raised more than $182 million for Colorado nonprofits. 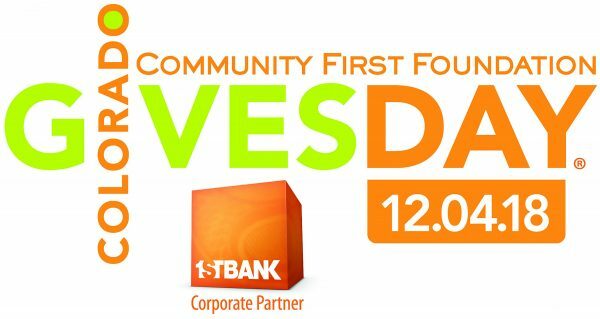 This year, Colorado Gives Day features a $1 million incentive fund, created by Community First Foundation and FirstBank. For every donation Community Table receives on Colorado Gives Day, we will receive a portion of the incentive fund! Thank you for thinking of your neighbors in need! 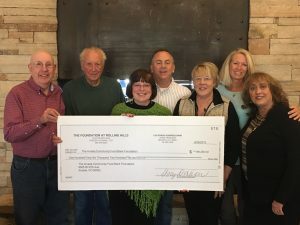 Many thanks to The Foundation at Rolling Hills for choosing Community Table as the beneficiary of their annual fundraising cocktail party and golf classic. This year’s event raised more than $146,000! Our sincere appreciation also goes out to the Arvada Community Food Bank Foundation for all their support and partnership in producing the “Havana Nights” themed gala and golf tournament held this past June at The Club at Rolling Hills. The Foundation at Rolling Hills, founded in 1999, is a nonprofit organization with the mission of raising funds for the benefit of worthy charitable causes in the local community. The Foundation is one of the few clubs in the country that supports local charities in this manner. The Foundation at Rolling Hills has raised over $2 Million since its inception primarily through the annual golf classic celebration.